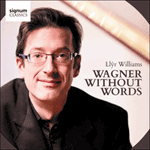 Llŷr Williams has made his own transcription of various scenes from Wagner’s last opera, Parsifal. In the opening 'Transformation Music', transcribing music which covers the scene change in Act I of the opera, its bell-like effects are particularly well suited to the piano’s sonorities; the more agonized and richly harmonized music heard at the heart of this section represents the agonies of the wounded knight, Amfortas. The movement ends with a passacaglia-like procession based on the tolling of bass bells. The heroic fanfares with which the following section starts represent our title hero; the Flower Maidens, sent to tempt him, are closely related to the oriental seductresses painted by such members of Russia’s Mighty Five as Balakirev and Rimsky-Korsakov. In the Good Friday Music, originally heard in the opening scene of Act III, we hear the emotional anguish of Kundry, the cursed woman, transformed and exalted by this holy day, the music finally fading out to the tolling of the bass bells first heard in the 'Transformation Music'.